From Shuwaikh Port (Kuwait) passing through Basrah (Iraq) and sightseeing the Gulf War shipwrecks on the way to Khorramshahr Port (Iran) for a wavy 5-hour ferry cruise surviving strict Port Immigration Process. Yes, It's very safe. WARNING: Persian Gulf Port Immigration is much stricter than in airport or rather than I thought. Maybe because of Kuwait's zero-tolerance against Syria/Iraq refugees or just because of Paris terrorism attack last 13th-November. Based on my observation, I think Persian Gulf Ports are intended for cargo shipment and local passengers. What do I expect... again for the nth time, during the departure/arrival I'm the only non-local passenger on-board. - bus #13, walk to the left side going to Shuwaikh port (entrance is in building's left side). On start of my Iran solo journey, the following was my experience on departure process in Shuwaikh Port (Kuwait) and arrival in Khoramshar Port (Iran) on Sunday November 08, 2015 at 1000H to 1600H ferry cruise. I took a taxi from Farwaniyah, fare at 2KD due to traffic jam in the morning. Then I bought my ticket on the 2nd floor, UAG Kuwait located exactly at the top of the departure corridor. Valfajr ticketing office is already closed. Ticket personnel validated my Iran tourist visa first then gave the ticket (economy roundtrip at 43KWD) together with the 2 passport photocopies for Immigration Officer request. There was no x-ray machine, Kuwaiti officers made the inspection of baggage manually. The process was the the same as in Kuwait Airport. Around 1000H, we took a service bus to the port then around 1030H we started leaving Shuwaikh Port. 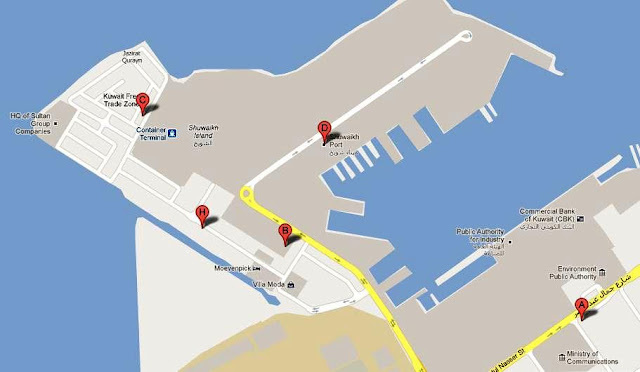 Photography and video is strictly now allowed within the port premises. 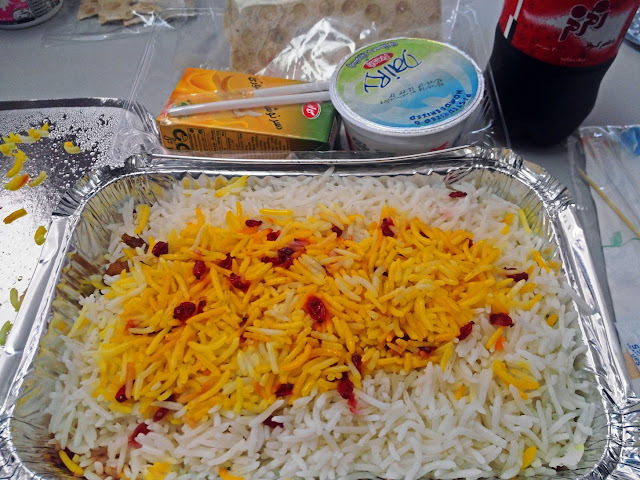 The Immigration Officers cater first all local Iranians while us, non-locals sit beside the lane. Then, on my turn after validating my tourist visa there was 2nd Officer just outside the IO desk and re-inspected my passport on all its stamped sheets. I waited for his re-inspection and found-out that my Turkey visa is the one he's suspicious. I told him I was there last year and just for holiday also. He then photocopied all my passport stamped sheets then hand-over the passport. The only way to go out of Khuramshahr Port is via taxi and the only english-speaking Iranian on location that time is the Information Desk. She assisted my for taxi to money exchanger first ($1=34,900 Rial), purchased my overnight bus ticket to Shiraz then to bus terminal itself. Exactly I reached the 1900H departure timing. I gave 280,000 Rial ($8) to taxi driver which includes the tip (I think the usual is 150,000 Rial). At the end of my Iran solo journey, the following was my experience on departure process in Khoramshar Port (Iran) and arrival in Shuwaikh Port (Kuwait) on Saturday November 14, 2015 at 1000H to 1600H ferry cruise. Around 16hrs overnight bus from Tehran to Khoramshahr. From Khoramshahr bus terminal, I took a taxi (100,000 Rial) to Khoramshahr Port, arriving at 0715H. Check-in time around past 0800H, x-ray conveyor, ticket validation then the 2nd Officer I encountered during my arrival here. He took only a matter of seconds because my passport was already assessed before. Then, at the passport control desk, the Officer let me passed-by without giving my passport. He asked me to sit in the boarding area. A matter of around 15mins I saw this Officer walking by in the boarding area handing-over my passport. 1st Officer; just from the gate before the Passport Control Officer, this 1st Officer asked me "what did I do in Iran?" then took my passport and brought inside his office, asked me to wait outside. A matter of 5mins he gave it back. 2nd Officer; also a Passport Control Officer, he just asked "what's my name?" then asked to put my index finger for scanning. This process just took me only less than a minute. 3rd Officer; just before the door at the back of Passport Control Officer, this 3rd Officer re-scan again my visa and asked "what did you do in Iran?". I said again for holiday/vacation. Less than 30 seconds he handed-over my passport. 4th Officer; the receiving area is on the 1st floor, departure area going out is on the ground floor. Right upon arrival on downstairs, this 4th Officer asked me "what did you do in Iran?". Again I replied politely then handed-over my passport in less than 30 seconds. 5th Officer; located on the Customs Area, this 5th Officer asked my again "what did you do in Iran?, what places did you visited in Iran?". Again I replied politely then handed-over my passport in less than 30 seconds. 6th Officer; the last part of the interrogation and the brutal. Since what they are doing is manual inspection, he inspection my bag entirely, even checking the photos on my digicam. While inspection my bag, he asked questions like "what did you do in Iran?, do you know someone in Iran?, how long did you stay in Iran? ", Is this your first time going to Iran?". About more than a minute he let me go by giving my passport back while I'm fixing my backpack from his unsystematic way of inspection.